Use a novice, beginner RC aircraft to learn how to fly RC. These beginner, electric RTF airplanes are easy-to-fly and come with all the required electronic components pre-installed. Additionally, your trainer RC airplane looks the part, we apply all the stickers and decal from the factory. Everything you need to fly comes in one box, so you can take your new trainer plane out as soon as it arrives! Fly remote controlled airplanes is a hobby that transcends generations – both young kids and adults alike can enjoy the thrills of flying an RC airplane. Trainer planes are the perfect buy for a new or novice hobbyist; they’re affordable and require less skill in flight navigation than more advanced models, but can be used for higher level flight mechanics as well. 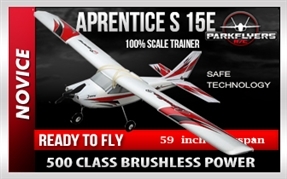 Buy a beginner RC aircraft from a trusted name and authority in the industry, ParkFlyers. Our trainer RC models feature some durable, high quality planes – many from the popular line of Sharper Image RC planes. We are now an authorized distributor of Sharper Image branded remote controlled airplanes and more RC products and toys! If you love remote controlled airplanes, you might also have a knack for RC helicopters. ParkFlyers RC recently developed our RC heli division, where we feature a great selection of affordable and fun-to-fly remote controlled helicopters. 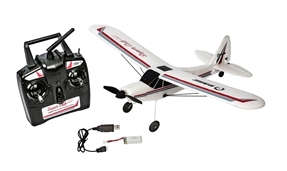 Buy novice RC airplanes from ParkFlyers RC, a trusted USA based online retailer of RC planes. We offer full product and tech support, so if you encounter any problems at all - give us a call at our toll free phone number: 1-800-470-8932. At ParkFlyers RC “Electric Ready to Fly RC Airplanes and RC Helicopters” is our mantra.